Didi May Be Ready For Bike Sharing, But What About The Rest Of The Nation? Didi-Uber, China’s newly minted transportation tycoon, has revealed intentions to append a bike sharing service to its hefty platform, as it pours tens of millions of U.S dollars in strategic investment into dockless smart bike company Ofo. The ride sharing company has no trouble divining a future where bike sharing becomes the latest installment on its platform, already laden with everything from buses to chauffeur services. Among cooperation in urban rideshare, Didi also plans to be “offering quality bike-sharing experience on Didi’s platform,” said the company as it announced the investment. Ofo claims to be world’s first dockless bike sharing services–unlike many public bike systems that set aside a multitude of procured bikes for common use, the company founded by 5 Peking University students is attempting an Uber-like light asset approach. Users are encouraged to donate their personal bikes to Ofo in exchange for unlimited access to bikes in Ofo’s pool. Yet Ofo seems less than prepared for a full blown presence on Didi’s platform. The company’s conspicuous yellow bikes are currently available only in select university campuses, only accessible after registration with a student ID, and once students are done pedaling, the bikes have to end up within university gates. A spokesperson from the company said that there were no definite plans to expand their system to outside campuses, and that a deliberation to do so depended on “range of factors”. It’s not hard to see why Ofo is getting cold feet, even as a flood of capital from the impatient investors prods this utopian model forward to enter the real world. For one, Ofo’s going rate is 0.01 yuan per minute and 0.04 yuan per kilometer, (hence a 5 hour, 5 km ride would cost 3.2 yuan, or less than 50 U.S. cents), even cheaper than Mobike’s 2 yuan or 0.30 USD per hour, which has already been subject to skepticism over its ability to turn a profit. In the past months that bike sharing has been in the limelight, reviews have been not at all encouraging: unadjustable seats, system errors unlocking the bikes though QR codes, the sheer difficulty in locating a bike within walking distance, and the fact that they are downright heavy if you need to carry them up a flight of stairs. Users’ patience is becoming threadbare, so say the least. Though we have to give Ofo credit for cutting procurement costs by pooling together bikes, in a less than idealistic society, their model could end up as a textbook example of Gresham’s law: who want to trade in their multi gear mountain bike to ride around on creaky old two-wheelers, considering they only cost about 2 yuan per ride? Even the cheapest bike costs around 500 yuan ($75 USD) today, so when users do the math, would it really pay off to swap a personal, albeit used bike for “lifetime membership” for bicycle collectives? 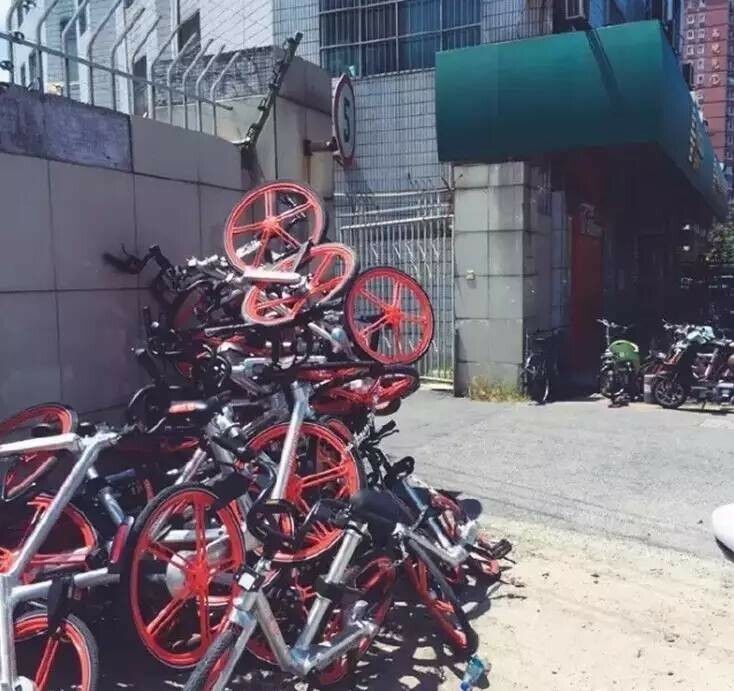 Mobikes, which has taken multiple cities by storm, suffer vandalism and are piled to be sold as scrap metal. Not to mention the amount of or wear and tear or malicious vandalism that the bikes undergo. It is distressing and hard to believe that with China’s per capita GDP of nearly 8000 USD, some of these bikes have had their QR codes scratched out, other padlocked, and others still collected to be sold as scrap metal. As tech savvy as these bikes may be, they’ve not yet cracked the code to poor citizenship behavior.